Please refer to our stock # 1837pr when inquiring. Framed in fancy metallic frame commemorating the death of Napoleon's son. In Austrian uniform, probably mid-19th century. 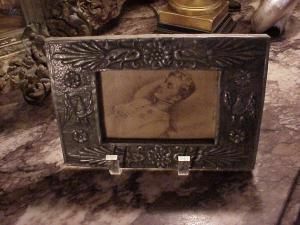 Frame is unusual as it completely surrounds the back of the picture--the picture is entombed--which given the nature of the image, is appropriate. $125.